I am an Indian national living in the US. My H-1B (1st term) expired in August 2016. I have an I-797A (H-1B visa extension document) valid until July 2019. I went to the Turkish Consulate in Boston to get a visa sticker but they said I am still eligible for an e-visa and was told to show my I-797A upon arrival. Has anyone traveled to Turkey with an I-797A as a supporting document? My itinerary is Boston to Istanbul (5 day stay), on to India and return to Boston. 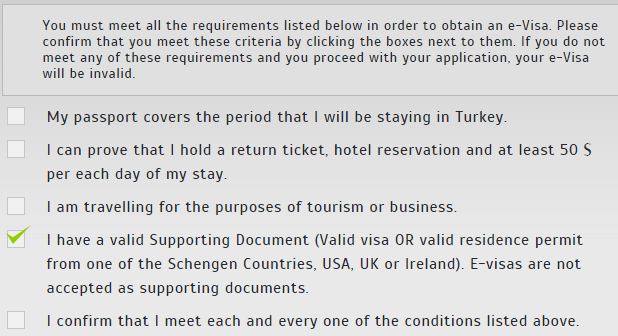 Has anyone traveled to Turkey with I-797A as a supporting document? "Form I-797A: Is issued ONLY to people who are currently in the U.S. and are undergoing a change of status (F-1-H-1, H-1-H-1, l-1-H-1, etc.). The “A” is for change of status approved, which means the applicant can continue to remain in the U.S. and work. Hence, I-797A will have an I-94 attached to it to endorse the status approved." Moreover you have already mentioned that you have I-797A (H-1B visa extension document) valid till July 2019, means you are a legal resident and can continue to work and remain in the USA till 2019. As you have already visited the most trusted authoritative place (Turkish consulate in Boston), therefore you will have to follow their instructions means simply apply for Turkish e visa. You must meet all the requirements listed below in order to obtain an e-Visa and I-797A (H-1B visa extension document) is a valid supporting document. Not the answer you're looking for? Browse other questions tagged visas indian-citizens turkey h1b-visas or ask your own question.